Working to Preserve Riverside County Recorded History - Ensuring a Link Between Past, Present, and Future Generations. 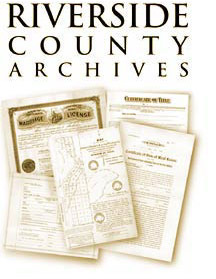 The purpose of the Riverside County Archives program is to identify, collect, preserve, arrange, describe records of historical significance relevant to the County of Riverside and County government, and to educate the public as to their use. The Archives serves as both a repository for these unique documents and as a resource center open to County staff and to the public. Materials relating to the history of the County and surrounding areas of influence are also collected to assist with the interpretation of these records, and to place them in the context of the overall growth and development of Riverside County.